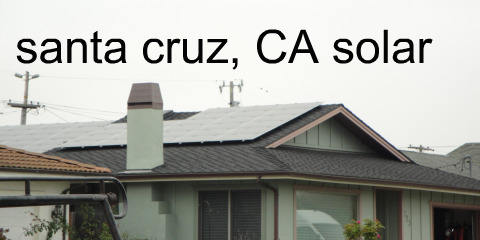 Tag Archive | "santa cruz"
There are all kinds of people who are living the solar dream in California. 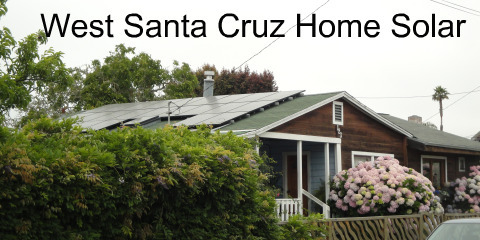 On a recent trip to Santa Cruz, CA I was on a bike ride for just over two hours, and took all kinds of pictures of the locals and their home solar systems. These are some of the pictures. I really liked the solar system above because it blended in so well with the surrounding houses. It really isn’t true what some people think about their solar electric systems being so ugly for all of their neighbors. In fact, if you did not closely, you surely would miss this house’s solar system. My best guess is that this is a 3kw system. Above is another picture of a nicely blended in solar system. It looks as though this system doesn’t have any shade problems either. My guess is that this is probably close to a 4kw solar system. The solar system above is located on two seperate portions of the roof. Sometimes space will force you to do something like this. However, if this is you, make sure that you don’t have different amounts of shading for the different sections. Otherwise you may find yourselves with a system that is not performing optimally. And make sure you have a solar installer who is very experienced installing this type of configuration. And better yet, ask the installer if they have put in a solar electric system with this layout before. This above is a solar hot water system. You will notice that for solar hot water, the solar panels are generally much larger than the typical 3 foot by 5 foot solar electric panels. A hot water solar system of this size is going to be able to produce plenty of water for a small apartment complex, and a swimming pool or two. This is a pretty large system. When it comes time to wash your solar panels, take it easy on them, no need to be scrubbing too hard. 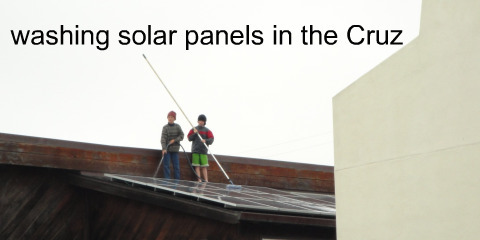 In general, for most parts of the country, there is absolutely no need to clean the solar panels on your system. I think that since this particular house is located just a block from the Pacific Ocean, maybe they are trying to remove some of the salt that is always flying around in the area, to make sure it doesn’t mess up any of the electric connections on the panels themselves. Above is maybe a 5 kw system as there seems to be two separate planes of solar panels all stacked together nicely in rows. So there you have it. 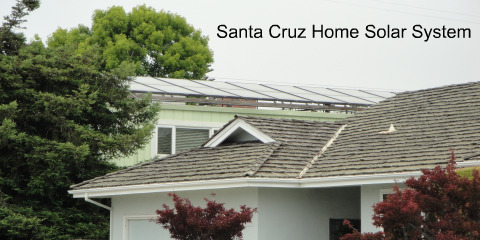 Tons of different houses with many different sizes and shapes of solar electric systems. All told, these systems together probably produce about $30-40 per day of electricity.